For the past three years, our organization has hosted a women’s group called the Wise Women’s Circle. It is an opportunity for women of all ages, from the community, to gather and talk and learn. The goal is to help each other open up to new possibilities. The group is small but faithful to the process. Last year, as I noted here, we worked on the idea of a vision board which would detail any aspect of our lives that we wanted to highlight. The project was meant to open a personal door and capturing unfulfilled goals or finding new ones. The six month long project was a fun exercise in learning more about our strengths. We have also spent a good deal of time studying the art and beauty contained in Tarot cards as well as the healing aspects of music and aromatherapy scents. 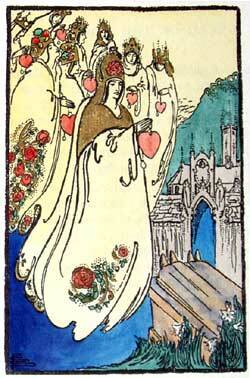 The art work is a drawing by Pamela Coleman Smith the illustrator of the Rider Waite Smith Tarot deck. As a group leader, it fills my need to find a creative self as well as supporting the efforts of women who walk the path of wise elders who came before us. I cherish this aspect of my community life and look forward to participating in this years activities. Note to self: Never ask anyone else to do something which you wouldn’t do.